Please see the previous article at http://ponnadi.blogspot.in/2014/07/virodhi-pariharangal-32.html. Asramam means the stage of life. In vaidhIka samprdhAyam, 4 stages of life are identified - brahamacharyam (after upanayanam and before marriage), gArhaspathyam (gruahasthAsramam - married/family life), vAnaprastham (secluded/detached life in the forest with the wife) and sannyAsam (also known as thuriyAsramam, uththamAsramam - ascetic - living alone as a full renunciate). Each Asramam has different set of rules and guidelines for the conduct of the persons in such Asramam. One should learn the guidelines for the particular Asramam he is in and follow them without fail. Living contrary to the guidelines of the particular Asramam is a big sin. Considering the length of the topic, the guidelines for each Asramam are not listed here. Translator's note: Life of a man is mainly divided into four stages as shown in dharma sAsthram. The first stage is the brahmacharyam (student/bachelor life). This starts when a boy undergoes yagyOpavItham (sacred thread) ceremony and receives brahmOpadhEsam (receiving sacred manthra from Acharya to inquire about brahmam). We will be discussing about varNam in the subsequent sections. Only persons of brAhamaNa, kshatriya and vaisya varNam undergoes yagyOpavItham and brahmOpadhEsam. Depending on the varNam, one is supposed to have this sacred thread cermony done at certain ages (brAhmaNa - 8, kshathriya - 11 and vaisya - 12; age calculated from the time of conception in mother's womb). Once brahmOpadhEsam is received, the child becomes qualified to learn vEdham with its ancillary subjects under an AchArya in gurukula. Usually, the child will go and stay with the AchArya at the AchArya's residence. They would study for a lengthy period learning the source text as well as meanings of vEdham, upanishadhs, ithihAsams, purANams, smruthis, etc., as necessary. kshathriya children will learn dhanur vEdha - the science of fighting and weapons. During the time of their study, the students are bound to take care of the teacher's bodily needs. The students would go out and cut the woods for firewood, beg for alms to bring grains for cooking, etc. Whatever is collected, that will be offered to the teacher and the teacher would then direct the students to properly use it. The students would also serve the teacher and keep him comfortable. brahmacharyam also means focussing on brahma vidhyA (supreme knowledge) and living a very simple and detached life. There is no room for comforts and material enjoyment - one should sleep on the floor, cannot accept/indulge in bodily pleasures like applying sandalwood paste or eating betel leaves/nuts. At this stage of the live, if one is trained properly, he will develop into a well-matured man with proper attitude towards spiritual life. Next, when they come out of the gurukula, the grown up person will be eligible to enter into gruhasthAsramam (family life). gruhasthAsramam is the married life. When one enters married life based on a vaidhIka wedding, he will take a vow of protecting their wife. He would also vow to beget offsprings who would be properly trained in vaidhIka dharmam. rishabha dhEva (an incarnation of bhagavAn) says in srI bhAgavatham, that one should accept the position of dhEva, bharthA (husband), AchArya (teacher) and pithA (father) only if he is capable/confident of leading the dependent to the path of salvation. The main duty of gruhasthas is to take care of brahmachAris and sannyAsis. They are ought to welcome unexpected guests with great devotion and care for them properly. nammAzhwAr glorifies properly situated gruhasthAramam life in thiruvAimozhi 8.10.11 as "nalla kOtpAttulagangaL ... nalla pathaththAl manai vAzhwAr koNda peNdir makkaLE" (நல்ல கோட்பாட்டுலகங்கள் ... நல்ல பதத்தால் மனை வாழ்வார் கொண்ட பெண்டிர் மக்களே). This padhigam (decad) "nedumARkadimai" is to establish the importance and glories of kainkaryam to bhAgavathas. At the end of this padhigam, nammAzhwAr says that the ones who are focussed on serving the devotees of srIman nArAyaNan, will have wonderful gruhasthAsrama life focussed on such kainkaryam and will thus lead a glorious life in this material world itself. Here, nampiLLai beautifully identifies an important principle - he says ideal family means, when the husband wants to serve srIvaishNavas, the wife and children would also follow such thought and serve along instead of having each one having self-centered interests. nampiLLai also highlights the incident in the life of selva nambi as an example. selva nambi who was greatly admired by periyAzhwAr is highlighted in the vyAkyAnams by our pUrvAchAryas as an ideal gruhastha. Once, when he was away, some srIvaishNavas visit his home where his wife welcomes them. But she realized she ran out of rice to prepare some prasAdham for them. So, she brings out the pack of paddy which was preserved for next year's farming (this is considered as very precious since the whole livelihood for the next year depends on that). She breaks the paddy, extracts the rice and gives a big feast to the visitors. When selva nambi returns and finds the paddy sack is empty, he enquires his wife about that. She says "I have sowed them now and they will be reaped in srIvaikuNtam" meaning "I have given them to srIvaishNavas and its the most apt kainkaryam". Hearing this selva nambi becomes extremely joyful - such was the dedication of selva nambi and his wife. nampiLLai also highlights thoNdanUr nambi, echchAn, etc as ideal examples of living the proper family life serving devotees all the time. Next is vAnaprastham (couple living in seclusion in forest). At a certain age (50+), couples retire from their regular life in village/town/city and go into seclusion and start living in a forest. Why is this needed? Because, when we are engaged in routine matters with family, children, relatives, etc., we may become too mechanical and miss out on focussing on bhagavAn in total. One of the important aspects in life is to meditate on bhagavAn constantly. That is facilitated by minimizing ones needs and living in seclusion in a very simple manner. At this stage, one lives in a simple hut, prepares very simple meals using the raw-materials that are found in the forest, lives with minimum set of clothes and engage the mind in meditating on bhagavAn for the rest of the time. It also gives an opportunity to serve the rishis who lived in the forest. But in srIvaishNavam, since the life was already simple, already centered around kainkaryam to archAvathAra emperumAn and bhAgavathas and there was plenty of opportunity to listen to the glories of bhagavAn through lectures, etc., and meditate on them, vAnaprastham was never practiced in reality as a separate Asramam. The last stage is sannyAsam. At this stage, the man gives up all his attachments and becomes an ascetic or a mendicant. sannyAsam means giving up ones wealth, family, relatives, etc., and spend the time fully in bhagavath vishayam. srIvaishNava sannyAsis are known to paramahamsa parivrajAka AchAryas. paramahamsa means highly intelligent like swan which can separate milk/water (sAram and asAram). Also, swans are known to live on swamps/muddy waters yet not affected by that at all - similarly sannyAsis living in this material world should still be unaffected by the worldly pleasure. Similar to bhramacharyam, the guidelines towards brahma vidhyA and material enjoyment are to be properly followed. parivarjAka AchArya means ones who travel around constantly and preach the highest knowledge to every one. Not only they preach, they are also seen as living examples of such high principles. Also, srIvaishNava sannyAsis (unlike others) keep thridhaNda (3 sticks), kamaNdala (water pot), shikA (tuft), yagyOpavItham (sacred thread), etc - unlike sannyAsis of other orders who give up some of these two. yAdhava prakAsa (former teacher of srI rAmAnuja) eventually accepts srI rAmAnuja as his AchArya and accepts sannyAsam from srI rAmAnuja and gets a new name gOvindhAchArya. emperumAnAr then instructs gOvindhAchArya to document the principles of sannyAsam as explained in sAsthram and the result is "yathi dharma samuchchayam". Though sannyAsis are not supposed to stay in a single place for more than 3 days, srIvaishNava sannyAsis generally stay in a mutt (usually associated with a dhivya dhEsam temple) and preach highest principles from there. Still, most sannyAsis take up periodical yAthrAs (pilgrimage) to preach the supreme knowledge far and wide. We have seen a bit about the Asrama system. While the Asrama is for the man, the woman's life simply follows the man's stages of life. Generally, woman is cared by the father until she gets married. After marriage, she is cared by her husband. Finally after the departure of the husband, woman is cared by her children. This is the vaidhIka system. Women are well cared for and they also play a very crucial role in the society and household. Usually they learn the wonderful principles easily from their parents and husband. They, in turn, start moulding the children at their early ages and prepare the children for the future. As a wife, they assist the husband in their kainkaryam. Whether it is thiruvArAdhanam or athithi sathkAram (taking care of guests), she is always participating in such kainkaryams with the husband. Naturally, being in a serene environment, they develop great intelligence and thorough understanding of sAsthram. It is said in dharma sAsthram, that whenever there is any doubt in our AchAram, anushtAnam, etc., one should enquire the elderly woman in the family and get it clarified - such was the importance and stature of women of vaidhIka families. kUrathAzhwAn's dharma pathni ANdAL, piLLai uRangA villi dhAsar's dharma pathni ponnAchiyAr, kongilAchAn's dharma pathni kongil pirAtti, etc., were few of the well known srIvaishNavis who were greatly glorified for their gyAnam, anushtAnam and kainkaryam. There were many of them. With this introduction let us now move on to the actual section. Considering oneself as purely belonging to a particular Asramam instead of considering ones eternal servitorship to bhagavAn is an obstacle. Whichever Asramam a person is in, the jIvAthmA's svarUpam (true nature) is to have sEshathvam (servitude) and pArathanthriyam (total dependence). "dhAsa bhUthAs svathas sarvE" is a common pramANam - this means all jIvAthmAs are secondary/subservient to bhagavAn. This servitude is beginningless and eternal. Translator's note: In AchArya hrudhayam, azhagiya maNavALa perumAL nAyanAr beautifully highlights the importance of kainkaryam over sAmAnya karmAnushtAnam. In chUrNikai 31, he says "jAthyAsrama dhIkshaikaLil bhEdhikkum dharmangaLpOlE aththANich chEvagaththil podhuvAnathu nazhuvum" (ஜாத்யாச்ரம தீக்ஷைகளில் பேதிக்கும் தர்மங்கள்போலே அத்தாணிச் சேவகத்தில் பொதுவானது நழுவும்) - Just like certain aspects of dharmam will be skipped based on ones varNam, Asramam and specific vows, when one is engaged in confidential kainkaryams (services) to bhagavAn/bhAgavathas, the common varNAsrama dharma anushtAnams (practices) may be skipped during such kainkaryams. mAmunigaL's commentary is most beautiful for this chUrNikai. He beautifully explains varNam, Asramam and dhIkshai and then explains how such sAmAnya dharma anushtAnams (routine activities based on ones own varNam and Asramam) will become insignificant for a truly realized person. He finally concludes that, our pUrvAchAryas still followed ones own varNa/Asrama anushtAnams out of great compassion over others who may be misguided seeing them not performing the same. So, we can clearly understand that when in kainkaryam we can clearly skip/delay karmAnushtAnams. parAsara bhattar practically demonstrated this - once when he was performing kainkaryam to namperumAL in the evening time, when some one reminded him about sandhyAvandhanam, he says since we are in kainkaryam we need not worry about that at that moment. Being proud that one is a uththamAsrami (sannyAsi) is an obstacle. When one becomes a sannyAsi, many will fall at his feet, worship them and even glorify them as "yathi" (mendicant), "jIyar swamy" (His Holiness), etc., since sannyAsis lead austere life style. But one should not become proud on hearing such glorifications - one should constantly think that they are servants of bhagavAn/bhAgavathas and act accordingly. Not knowing that avaishNava Asrami (sannyAsi) is lower than svapacha is an obstacle. Asrami here indicates sannyAsi. Since avaishNava sannyAsis give up their sikA, yagyOpavItham, nithya karmAs like sandhyAvandhanam, etc., and most importantly they do not accept ultimate supremacy of srIman nArAyaNa and hence they must be considered as very fallen. svapacha means one who cooks dogs and eats them - very fallen. Such avaishNava sannyAsis are called pAshaNdis. Translator's note: In AchArya hrudhayam, azhagiya maNavALa perumAL nAyanAr explains the glories of bhAgavathas in great detail. He also derides people who are simply focussed on varNam and Asramam instead of understanding the essence of such varNAsramam dharmam is to have devotion towards srIman nArAyaNa. In 86th chUrNikai, he explains that such varNam, Asramam, gyAnam and anushtAnam which does not focus on bhagavAn is useless. In this, he says a sannyAsi who lacks devotion is lower than a svapacha. mAmunigaL beautifully explains each aspect with pramANam from sAsthram. He quotes "svapachOpi mahIpAla vishNubhakthO dhvijAthika: vishNu bhakthi vihInasthu yathichcha svapachAdhama" (ச்வபசோபி மஹீபால விஷ்ணுபக்தோ த்விஜாதிக: விஷ்ணு பக்தி விஹீநஸ்து யதிச்ச ச்வபசாதம) - When a svapacha is fully devoted to vishNu, he is to be considered greater than a twice-born (brAhmaNa in this context) and even a sannyAsi, if he is not devoted to vishNu, he is to be considered lower than a svapacha. Same principle is explained by piLLai lOkAchAryar in srIvachana bhUshaNa dhivya sAsthram in sUthram 217. Not having dhAsya prathipaththi (service/kainkaryam attitude) in ones own Asrama is an obstacle. Similar to first point. Translator's note: For srIvaishNavas, whatever karmA is done, they become part of kainkaryam. piLLai lOkAchAryar explains this in mumukshuppadi sUthram 271 "karmam kainkaryaththilE pugum" (கர்மம் கைங்கர்யத்திலே புகும்) - for prapannas, all activities that are done according to sAsthram will count as service to bhagavAn. So, our karmAs should be done with such service attitude. Even after understanding the highest principles, having fear in giving up sAmAnya dharmam is an obstacle. We have discussed this in detail already. Once we understand the true nature of jIvAthmA as an eternal servant, kainkaryam takes precedence over karmAnushtAnam automatically. Indulging in activities that are contrary to ones own Asramam is an obstacle. One should avoid engaging in activities that are contrary to their Asrama. For example, it is said that sannyAsis should give up any connection to agni (fire) and hence they become disqualified to (directly) participate in any hOmam, yagyam, etc. They should not also engage in cooking which involves fire. They should also not offer betel leaves/nuts, etc to their thiruvArAdhana perumAL (personal deities worshipped by them). Translator's note: For each Asrama, there are several restrictions - brahamachAris and sannyAsis are suppose to live an austere life. brahmachAris should be focussed on gaining knowledge and serving their AchArya - anything contrary should be avoided. gruhasthas should be focussed on performing bhagavath/bhAgavatha/AchArya kainkaryams, assisting sannyAsi, etc - anything contrary should be avoided. sannyAsis should be focussed on propagating divine knowledge to everyone and helping others spiritually - anything contrary should be avoided. Naturally, all bhAgavathas (irrespective of varNam/Asramam) should be engaged in bhagavath/bhAgavatha/AchArya kainkaryam - anything contrary should be avoided. Not giving up such obstacles that are contrary to ones Asrama is an obstacle. Already explained in detail. Considering oneself great due to oneself being a sannyAsi and shying away from AchArya kainkaryam is an obstacle. nanjIyar being a sannyAsi served parAsara bhattar who was a gruhastha. Similarly, pinbhazhagiya perumAL jIyar served nampiLLai. 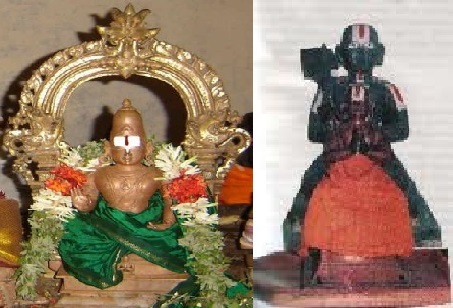 ponnadikkAl jIyar served azhagiya maNAvALan (maNavALa mAmunigaL in his times before accepting sannyAsam). These incidents show the importance of sishyas serving AchAryas irrespective of the Asramam they belong to. Translator's note: nanjIyar became a sannyAsi yet served bhattar with great devotion. Once when he was going to carry the palanquin in which bhattar was sitting. At that time he says if this thridhaNdam (3 sticks carried by sannyAsis) come in the way of my service, I will break this and throw it away. pinbhazhagiya perumAL jIyar was greatly attached to nampiLLai and performed very menial kainkaryams to him. ponnadikkAl jIyar became a disciple of azhagiya maNavALan (mAmunigaL in his pUrvAsramam) - he accepted sannyAsam even before mAmunigaL - yet he served mAmunigaL with great joy. These incidents highlight that sishyas, even if they are sannyAsi should serve their AchArya even if the AchArya is a gruhastha. One should learn and understand the scope of ones own Asramam and conduct oneself with in the boundaries of their Asramam. Already discussed in detail.